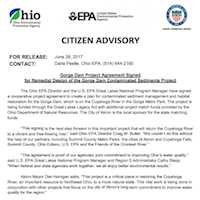 The Ohio EPA Director and the U.S. EPA Great Lakes National Program Manager have signed a cooperative project agreement to create a plan for contaminated sediment management and habitat restoration for the Gorge Dam, which is on the Cuyahoga River in the Gorge Metro Park. The project is being funded through the Great Lakes Legacy Act with additional project match funds provided by the Ohio Department of Natural Resources. The City of Akron is the local sponsor for the state matching funds. The Gorge Dam was constructed on the Cuyahoga River in 1913, and produced hydroelectric power until 1958. The dam pool was subsequently used until 1992 as a source for cooling water for a local coal-fired power plant. The dam and its pool have not been used for power generation purposes for the past 23 years. 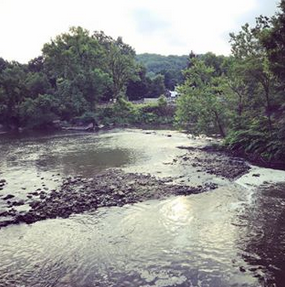 The structure acts as an impairment to aquatic species along the middle and lower segments of the Cuyahoga River, and Ohio EPA has proposed it be removed to improve water quality. This project agreement is the second phase of a much larger effort to remove the Gorge Dam, located on the Cuyahoga River in the cities of Akron and Cuyahoga Falls. Ohio EPA completed the first phase in 2015, which was a cost estimate for the removal and management of sediment and removal of the dam. The third phase will involve actual sediment removal and management with the fourth phase involving removal of the dam. Sediment removal and dam removal will each need their own individual project agreements, a process which will hopefully continue over the next several years.